Freshman Tariq Drake poses for a portrait at Peden Stadium. Tariq Drake went on a class trip to Europe after he finished his junior year of high school. But before he left, he wanted to commit to Marshall, the first school to offer him a scholarship to play Division I football. On June 1, 2016, Drake gave the Thundering Herd a call. When he spoke on the phone with them, though, they didn’t show the same level of commitment to him. “Marshall said they had to think about it again,” Chris Drake, Tariq’s father, said. Tariq was irritated. He had felt obligated to commit to Marshall since it was the first school to show interest. No others else mattered at that point. As soon as he got off the phone with Marshall, Tariq called Ohio, a school also at the top of his list. He was ready to be a Bobcat, and, unlike the Thundering Herd, the Bobcats didn’t have any misgivings about bringing him on. 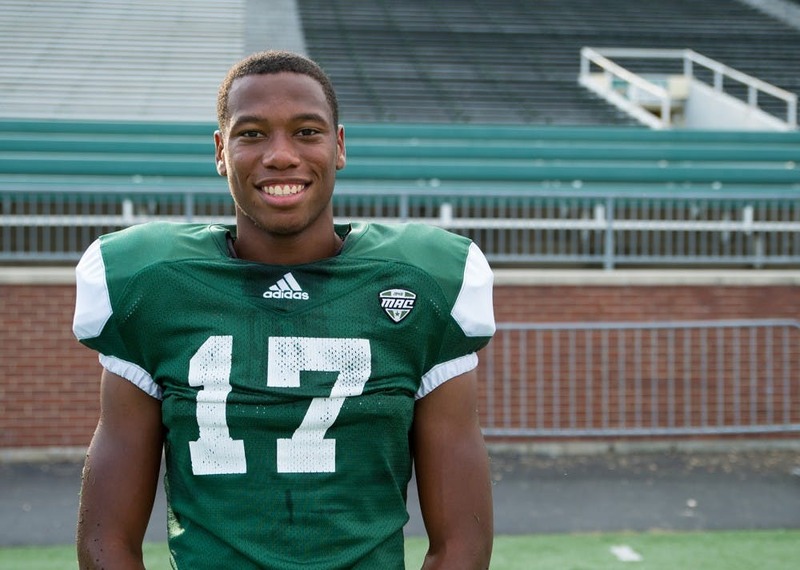 A freshman cornerback for Ohio, Tariq hasn’t played in any games yet. But his goal of playing college sports has been obtained. Drake, who grew up in Warren, came out of Labrae High School in Leavittsburg. And going to school for free to play college sports was a goal that he wanted and needed to achieve. “About the seventh grade I told him, ‘Tariq, we really can’t afford to pay for you to go to college,’” Charmaine Drake, Tariq’s mother, said. The only way Tariq was going to college was through sports. Fortunately, he was destined to play sports. His father played football and basketball through high school; his mother played baseball until she was 10 years old and played softball as she progressed through school. One of his uncles ran track at Ashland for two years, and another uncle played basketball at Tennessee State for two years. Tariq was exposed to sports early and started playing football at 5 years old. Football wasn’t always his favorite sport, though. He didn’t like the aggressiveness of it, and, because he loved basketball, Tariq thought he was going to be a basketball player. When Tariq was in the third grade, his dad signed him up for the basketball team at the local YCMA. Chris coached Tariq in basketball until his son got to high school, and he coached him in baseball and football through high school. Now, Chris is an assistant football coach at Labrae High School and the eighth-grade basketball coach at Labrae Middle School. He is also an assistant track coach at the middle school and high school. Though Tariq didn’t like football’s aggression, Chris wanted to explain to his son why football is the way it is. Tariq realized the fun part of football is hitting other players. And hearing fans cheering for him when he scored touchdowns wasn’t too bad, either. His love for basketball remained, but the athleticism required to be a good basketball player translated to football. Lateral quickness, agility, jumping ability — all those traits factored into being a good football player. Drake’s athleticism showed around the sixth grade, when he was one of the first kids to touch the backboard of a basketball hoop. “That’s where I started to notice where maybe I have some kind of potential in some kind of sport,” Drake said. Drake’s athletic potential was initially going to be harnessed in basketball. But in his sophomore year of high school, he realized basketball wouldn’t be his sport in college. He was still only 6 feet tall, and he wasn’t a point guard. Ohio wide receiver Keevon Harris knows how athletic Drake is. Harris, a redshirt freshman, went to high school with Drake and played on the basketball team, too. He remembers Drake doing a Euro-step as if he was about to do a layup, only to suddenly dunk on a 6-foot-4-inch teammate who tried to defend the play. Drake didn’t stop playing basketball – he was a four-year letter winner in high school. But after his junior year, the offers for football began to come in. He played wide receiver and cornerback at Labrae, two of the most athletic positions on the field. Linebacker Andrew Cree II, went to high school with Drake, too. Cree didn’t get dunked on, but he does remember competing on the field with Drake during practice. Drake’s athleticism earned him a scholarship to play college football. But more importantly, it earned him a chance to get out of Warren, an area where Chris says jobs aren’t as plentiful as other areas. Harris and Cree know what the area is like, so they wanted to help Drake get to college in any way they could. When Harris met Dwayne Dixon, Ohio’s wide receivers coach, Dixon asked Harris if he could return kickoffs. But Harris wasn’t being kicked the ball anymore. Cree told Drake about the Bobcats’ hard workouts, Ohio’s academics and how players on the team like to hang out and play video games together. Still, he was going to respect Drake’s decision. When Drake called Marshall ready to commit, he didn’t receive commitment in return. But Marshall wasn’t the only school on his list. Along with Marshall and Ohio, he had offers from Akron, Youngstown, Robert Morris and a last-minute call from Wake Forest the day before 2017 national signing day. But the atmosphere at Ohio and the close-knit nature of the team made the difference. “Even though he had not committed yet, they treated him like he was one of them,” Chris said. Correction: A previous version of this report misidentified Andrew Cree II’s position. The article has been updated to reflect the most accurate information.